Story is a basic principle of the mind. One story helps make sense of another. The stories we hear and the stories we tell shape who we are and who we become. The power of leaders hip can come from within – not only from what we do, but from who we are. How might I use the story as a tool for evaluating a current situation? How might the pattern of this story be repeated in another or in real life? Is it an effective pattern? How might I use story to reframe my story? What lessons can we (as a people) derive from stories? How can I/we apply them in ways that will transform the present situation into something better? What lessons can we learn from the stories of history to help us succeed in the present? How can I help to bring about the changes? What leadership qualities will I need to take with me from high school? How can I develop or improve the leadership skills I do not yet have? How do I know if I am developing the academic skills that I will need in my future life?How can I use my talents to create new opportunities for myself and for others? What qualities do effective leaders share? How can I lead through relationships with people as opposed to leading through control over people? How do I live a life that will inspire others? Who is Chinua Achebe? Describe his background and life. Why is Things Fall Apart relevant? Why is it studied today? What is the context of the novel? What is it about? How is the story constructed? 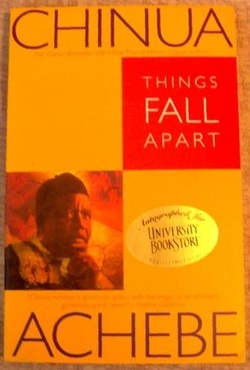 Things Fall Apart "The Fiction and the Facts. The Poetry and the Prose"
“Tragic Hero.” Brainstormservices.com. Stacy Eche, n.d. Web. 15 Oct. 2013.